You’ve done your homework. You’ve optimized your product assortment and were sure to strike the right balance of new products and established brands on-shelf, but you’re not converting shoppers into buyers. Why not? 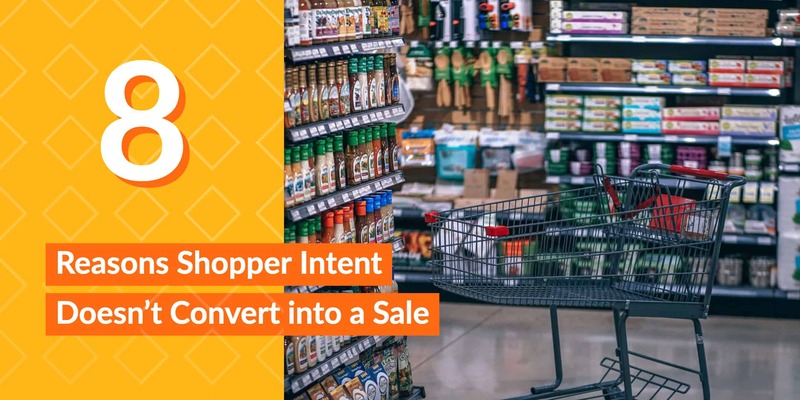 There are numerous reasons shoppers don’t convert into buyers; below are some of the 8 most common opportunities that you can address to create more sales. 1. Everyday price is too high – Some consumers are trained to ‘cherry pick’ promotions. Some shoppers may be waiting for a promotion to execute before they make their purchase. Having a price strategy and executing against it could be helpful in understanding your shoppers buying habits. Do you run a high/low strategy or are you an Every Day Low Price (EDLP) player? Keeping these pricing plays in mind will help uncover why not all shoppers convert into customers. 2. Promotional frequently – Consider your last trip to the local grocery store, was Coca-Cola or Pepsi on sale? Odds are one of those two major brands was offering a sale. Some customers have been trained to wait for sales and won’t purchase at regular retail. Of course, this don’t always hold true and necessity items may be purchased on or off sale. If you or your competition are on promotion too frequently you may not see volume on ‘off weeks’. 3. Out of stock – If it’s not on the shelf, it can’t be sold. Out of stock SKU’s could stem from a multitude of origins. Is this SKU a true out of stock where the recent PO’s have been cut? Is this product sitting in the backroom waiting to be loaded? Is this product found somewhere else in the store, not leaving enough product to fill the shelf? Regardless of the reason, if the consumer can’t find the product, you can’t covert intent into a sale. 4. Poor presentation – We’ve all witnessed poor merchandising or execution at shelf. In fact, some customers will walk away from a section if it is too confusing or messy to shop. Ensure that your planograms are easy to shop and are executed at store level. Top tip: leave enough space for your customer’s hand to fit comfortably onto the shelf when developing your POG’s to maximize shop-ability. 5. Competition – Sometimes you simply get beat by the competition. There is a reason sports teams play the games and don’t simply compare stats on paper. Any team can win on a given day. The same holds true for retailers; the opposite is also true. If you didn’t covert intent into a sale maybe your competition had a more enticing promotion, better assortment, unique offering, or something else altogether. Ensure you know the players you’re competing against to maximize your sales potential. 6. Seasonality – Some SKU’s are very seasonally driven. Although your shopper may have intended to pick up your product, if the weather is different than expected you may not have a sale. Monitoring changes in weather could help you anticipate this sudden increase in demand – and sales! 7. Need vs. want – There are times that you’ve executed all of the necessities: the shelves are stocked, the pricing is right and the product is in code, but you still don’t make a sale. Why not? Sometimes it’s a question of need vs. want for your shopper. Some people may be impulse shopping while others will know you carry the products they need to purchase at a later date. Sleep well knowing that you’ve done all you can and may have the opportunity to covert that browser into a buyer in the future. 8. Code issues – While code dates vary between departments and like items, the fact is that customers need to interpret your code dates to be within their acceptable range to make a purchase. Clearly, if you’ve got coded product on the shelf, you’re not going to make a sale. Ensuring your operations/logistics departments are in check can give you the best chance of having fresh product on the shelf preventing out of codes from ruining a potential sale.